It has long been known in China that the internal energy generated by Tai Chi is good for one’s health and can be used for martial purposes. What has not been emphasized until now is how effectively Tai Chi can prepare one to heal others. This DVD clearly establishes the relationship between Tai Chi and healing. The first series of Chi Kung exercises in this DVD was designed specifically to detoxify the body and clear out the meridian system, enabling you to heal yourself. These exercises include stimulation of the body with percussion, bone marrow washing, loosening of the joints, the 5 healing sounds and colors, and the 5 most useful acupressure points. The deep breathing techniques calm you emotionally and mentally and the segment on quiet sitting allows your higher self to become known to you. 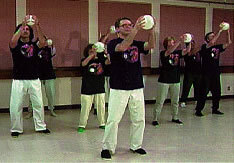 The next series is a brief style of Chi Kung/Tai Chi called “The Pearl of Immortality” and is accompanied by an instructional segment for easier learning. This style was chosen because it most effectively clears out the specific meridians of the body that are used in healing. We’ll ship your DVDs immediately so you can start reaping the benefits of Tai Chi for Healing! If not completely satisfied, send it back for a full refund. Order today!